The human intestinal system contains a complex community of microorganisms, the intestinal microbiome, which metabolizes food components that have not readily been digested. However, there are also microbial degradation processes occurring in the colon that may have negative effects on the human host. A research team headed by biologist Dr. David Schleheck reports that a key enzyme was discovered in a research collaboration with Harvard University (U.S.). This enzyme is involved in the degradation of the substrate taurine, which is abundant in the colon, by the intestinal bacterium Bilophila wadsworthia. This process generates toxic hydrogen sulphide. Increased hydrogen sulphide production is thought to be associated with higher permeability of the intestinal barrier, and higher susceptibility to infections and colon cancer. Moreover, Bilophila wadsworthia can act as a pathogen, for example, in appendicitis. The results were published in the current issue of the Proceedings of the National Academy of Sciences (PNAS). Taurine is introduced into the human digestive system primarily through a high-fat diet, but also through meat. A high-fat diet leads to increased production of bile acids, one of which is taurocholate, supporting the digestion of fat. In the large intestine, however, the Bilophila bacteria degrade the taurocholate to taurine, and use the taurine for anaerobic energy generation in the absence of atmospheric oxygen, producing toxic hydrogen sulphide. This special type of energy metabolism by Bilophila, the "bile-acid loving" organism, was first described 20 years ago by the research group of biologist Professor Alasdair Cook at the University of Konstanz. In this pathway, a sulphur-containing group of taurine is split off and reduced to hydrogen sulphide. However, until today, it was unknown which enzyme in the strictly anaerobic Bilophila bacteria is responsible for this cleavage. The discovery of a novel glycyl radical enzyme has now enabled David Schleheck's research team to close this knowledge gap. 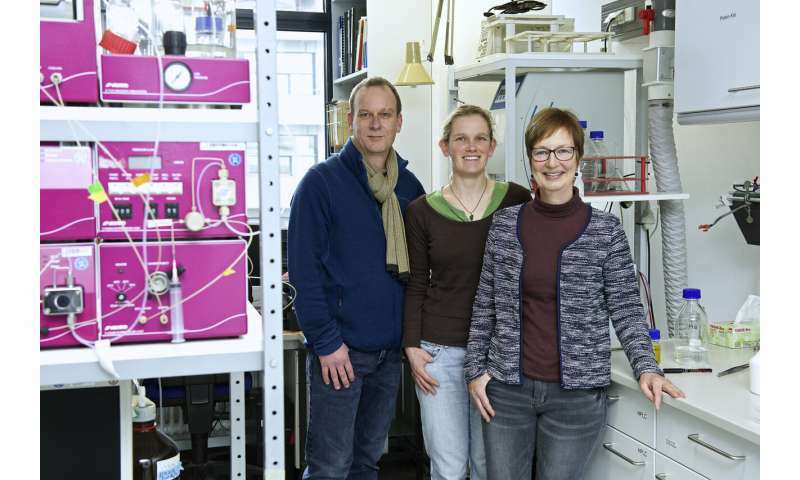 This enzyme was first identified at the Proteomics Centre of University of Konstanz. By means of a total-proteome analysis, the researchers compiled a complete list of the proteins present in the bacterial cells during growth with taurine. "We found that an unknown glycyl radical enzyme is produced in very large quantities during growth with taurine, but not during growth with reference substrates," reports David Schleheck. "This enzyme function did fit exactly into the gap of our understanding of the Bilophila taurine degradation pathway. We have thus discovered a novel enzyme that can catalyse cleavage of such sulphur-containing groups," explains David Schleheck. A crucial factor is that the enzyme is extremely oxygen-sensitive. This means that it can react only under strictly anoxic conditions, that is, in a strictly oxygen-free environment, and hence, it can only be examined in the laboratory under such strictly anoxic conditions. Biologist and co-author Karin Denger, who had already been a member of the Cook team: "Back then, we had discovered similar taurine degradation pathways in a wide range of other bacteria. But at that time we did not realize that the pathway in Bilophila bacteria is so different." David Schleheck, co-author Anna Burrichter and Karin Denger, who is now a member of the collaborating research team of chemist Professor Spiteller at the University of Konstanz, were also able to win two specialists for glycyl radical enzymes from Harvard University as collaboration partners for their study, Professor Emily Balskus and Dr. Spencer Peck. 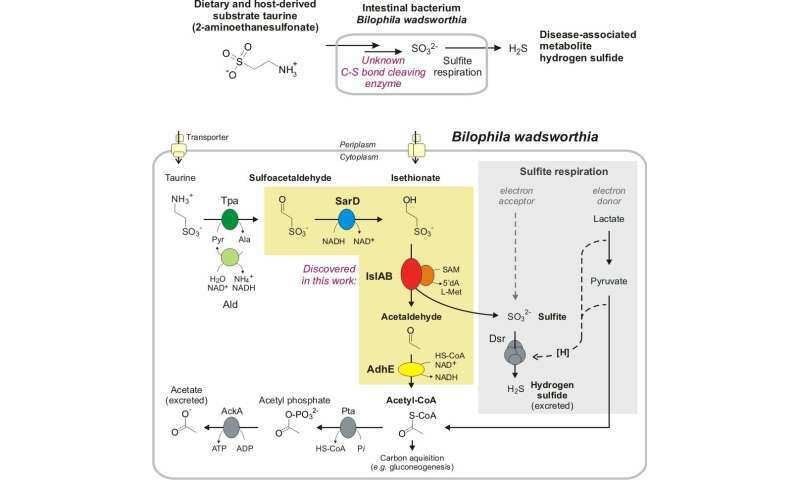 They were able to produce the Bilophila enzyme also recombinantly in Escherichia coli, purify it and, above all, subsequently reactivate the enzyme system and thus confirm its enzyme function. "With this methodology, we will be able to work on similar sulphur-group cleaving enzymes in the future, since we have found a large number of such enzymes in many important intestinal bacteria, though the functions of these enzymes are still completely unknown," says David Schleheck. Apart from its harmful effects, hydrogen sulphide formation in the intestine might also be beneficial for human health, at least at much lower concentrations, since hydrogen sulphide can also act as a signaling compound in humans. "Doctoral student Anna Burrichter recently described the bacterial production of hydrogen sulphide from a component of the vegetable diet, from sulfoquinovose," says David Schleheck, "while now, we were able to elucidate the bacterial formation of hydrogen sulphide from the substrates taurocholate and taurine. For a better understanding of the complex symbiosis of intestinal microbiome and the human host, and of the role of hydrogen sulphide, it is important to know all the pathways that can lead to hydrogen sulphide production, particularly in dependence of the dietary conditions of the host." As David Schleheck points out, other intestinal bacterial degradation pathways are already being studied in his group.